The San Francisco Bay Area is noted for its commercial and residential flat roof buildings since our weather conditions do not require high roof slopes to shed off snow. Flat roofs have become popular in our area since they are easier and less costly to construct and enable architects to design efficient interior spaces in contrast to pitched ceilings structures. Unfortunately, a flat roof has one quite serious drawback – drainage. Even though your flat roof should normally be constructed with about a 15° slope to allow for rain drainage, the reality is that a large percentage of flat roofs do not drain as efficiently as pitched roofs. The water that forms puddles on roofs can eventually damage your roof, especially since the damage may go unnoticed for some time. Water damage usually goes unnoticed because it first soaks through the roof, then through the insulation and any structure below. By the time it is noticed, the majority of damage will have been done. The best-proven solution to help you avoid flat roof issues is applying Spray Polyurethane Foam (SPF). This incredible material will not only provide you with one of the highest levels of insulation but will also provide lifetime protection for your flat roof with minimal maintenance. 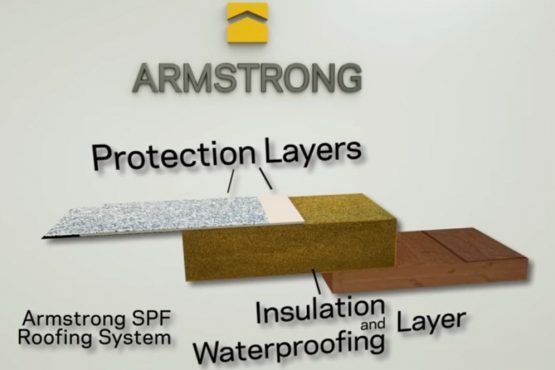 For over 30 years Armstrong Roofing has been protecting San Francisco’s flat roofs with SPF. The scientific data that has been collected undisputedly proves that it’s one of the most durable, energy efficient and sustainable roofing systems available for flat roofs (for more details please view our online video and read SPF Roofing: An Overview). The comparatively high R-value of SPF roofing systems and the reflective nature of their light-colored reflective coating will keep your home warmer in winter and cooler in the summer. Your SPF roofing system will start reducing your energy costs from the very moment it is installed. It’s estimated that SPF’s highest-rated insulating technology can help you reduce your heating and cooling costs up to 40%. What’s more, beyond providing an immediate return on your investment, it will also deliver a higher level of comfort in your home environment for you to enjoy for years. The long term comfort and savings with only minor future costs is the result of the minimal maintenance of the protective UV coating once every 15 years. Armstrong’s SPF roofing system challenges roofing norms with exceptional sustainability and peace of mind. SPF roofing is extremely durable and can be easily repaired without compromising the integrity of the roofing system. Unlike traditional roofing systems (e.g. build-up-roofing), which when repaired or replaced, produce costly tear-offs and waste which will need to be disposed of in landfills, SPF roofing systems help us avoid these issues and protect the environment. What’s more, according to our former US Secretary of Energy and Nobel Prize winner, Dr. Steven Chu, white roofs and buildings are the cheapest and most effective way of tackling global warming and saving energy (for more information please read White Roofs: Low-Cost Energy Conservation). In fact, in areas where there are many white roofs, “the urban heat island effect” can be reduced during the hot summer months. This will reduce our demand for electricity which means power plant emissions will also be reduced. For more information about SPF roofing systems and their installation process, call Armstrong Roofing today. We offer a no-obligation quote and can arrange a Free Consultation to show you why SPF Roofing is the best investment for your home’s or business’ flat roof. Flat roofed homes are unique and offer sleek lines, designed with style. However, flat roofs come with their fair share of problems. Copyright 2019 Armstrong Installation Service.